When bold words from FDR stirred a beloved American artist to action, the result was a set of paintings that forever captured our country's spirit. Nearly a year after Roosevelt’s address—immediately dubbed his Four Freedoms speech—the devastation of Pearl Harbor eliminated any lingering possibility that America might sit out the war. But as bad news arrived from all fronts in early 1942, it became obvious that Americans’ commitment to the war effort would need to be stoked continually. Manufacturers and every level of government would certainly play a role. So would many smaller organizations and individuals, including illustrators. "The artist, through the dramatic appeal of his posters, becomes the government’s mouthpiece in a language every citizen can understand," declared an article in American Artist magazine. Rockwell needed no further encouragement. Already a phenomenally successful illustrator with more than 200 Saturday Evening Post covers to his credit, Rockwell was eager to contribute inspirational images to help drive the war effort. He struggled with the challenge of devoting his talent to something "bigger than a war poster, to make some statement about why the country was fighting the war." Roosevelt’s Four Freedoms speech had struck a chord with Rockwell, but the lofty language contrasted sharply with Rockwell’s folksy images of small-town America. "I juggled the Four Freedoms around in my mind, reading a sentence here, a sentence there, trying to find a picture," he later recalled. "But it was so high-blown. Somehow I just couldn’t get my mind around it." 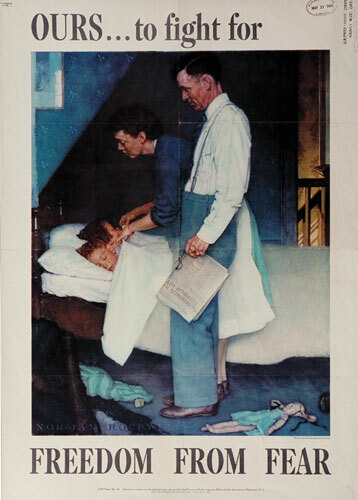 So, while the Office of War Information (OWI) in Washington began churning out dozens of war posters, Rockwell sat pondering how he might bring such lofty words down to earth. Invigorated by his visions, Rockwell set to work with a passion, and in just a few days had completed four full-size preliminary sketches of the ideas. Soon afterward, he set off for Washington, DC, with fellow artist Mead Schaeffer, who had some sketches of his own to show the OWI. Rockwell’s hopes were sky-high. "I got all excited," he enthused. "I knew it was the best idea I’d ever had." In the capital, however, his grand idea failed to spark any interest. One government official after another gave Rockwell’s Four Freedoms a perfunctory glance before politely thanking Rockwell and Schaeffer for their patriotism and then offering regrets. "The war was going badly," Rockwell recalled in his autobiography. "Nobody had time for posters. Robert Patterson, the undersecretary of war said, ‘We’d love to print your Four Freedoms, but we can’t.’"
Rockwell and Schaeffer made it clear they did not expect to be paid for their posters, but it made no difference. "Finally, late in the afternoon, we found ourselves in the Office of War Information…," Rockwell wrote. "I showed the Four Freedoms to the man in charge of posters but he wasn’t even interested. ‘The last war you illustrators did the posters,’ he said. ‘This war we’re going to use fine arts men, real artists. If you want to make a contribution to the war effort you can do some of these pen-and-ink drawings for the Marine Corps calisthenics manual. 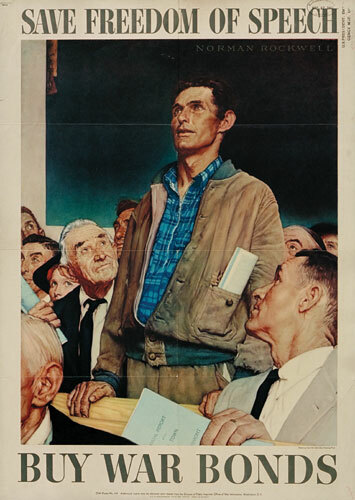 But as far as your Four Freedoms go, we aren’t interested.’" Rockwell declined the offer to illustrate the exercise book and threw in the towel. The next morning, he and Schaeffer boarded a train for Philadelphia. Still smarting from his failure to interest the OWI in what he considered his best idea ever, Rockwell found it hard to get excited about the meeting with Hibbs—until he mentioned off-handedly that he had been in Washington they day before. Hibbs asked him why. When Rockwell described the Four Freedoms series, Hibbs perked up: "Let’s see it." "So I hauled the sketches out and showed them to him," Rockwell remembered. "Ben listened attentively. Then he broke in: ‘Norman, you’ve got to do them for us…. 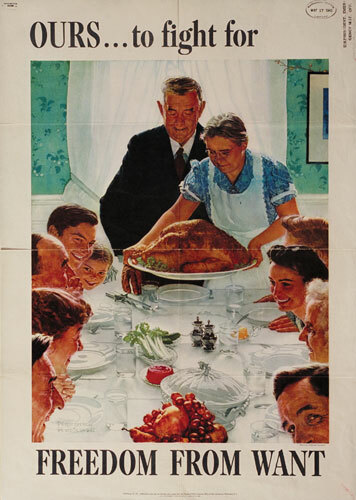 Drop everything else,’ said Ben, ‘just do the Four Freedoms.’"
Rockwell left Hibbs’s office with a promise to deliver the finished paintings within two months, but the task evolved into an agonizing six-month ordeal. "I had a terrible time," he admitted. "I started the first one I did—Freedom of Speech—over four times. I practically finished it twice, finding each time when I had just a few days’ work left that it wasn’t right." Freedom of Worship proved even trickier. "Most of the trouble stemmed from the fact that religion is an extremely delicate subject," Rockwell wrote. "It is so easy to hurt so many people’s feelings." Rockwell’s original sketch for Freedom of Worship had depicted a diverse group of people cheerfully getting along in a barbershop, but the scene was ambiguous and lacked conviction. "I discarded the picture and started another…. But that didn’t work out either," he recalled. "I started another, junked it." After the final image took form, Rockwell couldn’t quite remember where his final ideas had come from. "There is a mystery about the phrase which is lettered across the top of the painting—‘Each according to the dictates of his own conscience,’ he wrote. "I know I read it somewhere but no one has been able to find it in any book or document." Perhaps not surprisingly, the two paintings that gave Rockwell the fewest fits—Freedom from Want and Freedom from Fear—ultimately proved the least satisfying to him. He felt that they lacked the "wallop" of Freedom of Speech and Freedom of Worship. An American public in need of encouragement didn’t seem to notice any shortcomings. According to Hibbs, when the Four Freedoms appeared in four consecutive issues of the Saturday Evening Post beginning on February 20, 1943, they "quickly became the best-known and most appreciated paintings of that era. They appeared right at a time when the war was going against us on the battle fronts, and the American people needed the inspirational message they conveyed so forcefully and so beautifully." The man who had inspired Rockwell with his January 1941 address to Congress could not have been more pleased. "I think you have done a superb job in bringing home to the plain, everyday citizen the plain, everyday truths behind the Four Freedoms," Roosevelt told Rockwell. "I congratulate you…for the spirit which impelled you to make this contribution to the common cause of a freer, happier world." Bruce Heydt is a former editor of British Heritage magazine and a frequent contributor to America in WWII. This article originally appeared in the February 2006 issue of America in WWII. Order a copy of this issue now. 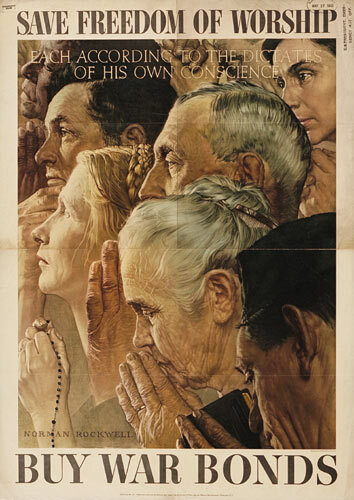 Illustrations: Government-issued posters promoting the sale of war bonds feature Normal Rockwell's depictions of the Four Freedoms that President Franklin Roosevelt declared to be essential to America.